It’s not all about weddings and corporate events here at ABC Marquees, we like to get involved in a good party too! This Party Package is from just £2,775 and can be tailored for up to 110 guests – that’s just £25 per head. Plus we can supply furniture, furnishings, catering* and everything you may require to make planning your party an effortless success. Included in the package price, we offer you a 9m x 24m marquee with all the necessary furniture and accessories to comfortably host your guests – that’s ample room for up to 11 dining tables, a bar area, a stage and the all-important dance floor. 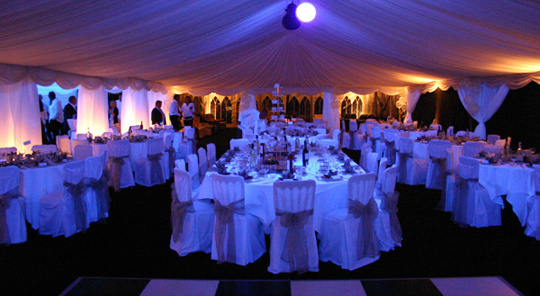 We can also organise a local venue* for you, if required, with many options in and around Sussex, or provide a marquee in your garden or chosen outdoor venue. This package is not valid for weddings and is subject to availability. Changes to the specification may incur additional cost. * Catering and venue hire is at extra cost, please enquire for details. ** Delivery is free within Sussex; please contact us for a quotation for delivery to venues further afield.